The Bible makes clear that our viewpoint and stewardship of the possessions God entrusts to us are enlightening indicators of the spiritual condition of our hearts. This includes how we handle the truth of the gospel, our time, our God-given gifts, the people He has placed in our lives and the material blessings He has made available to us. One aspect of our worshipful response to God’s grace in our lives is to give of our financial resources from a place of gratitude. At O.C. Singles for Christ Church we offer several ways to give - our Friday Evening Family Gatherings, Online, Zelle, or via USPS mail. Should you prefer giving by mail, we have offering envelopes available at our Information Table available any Friday Evening. If you would like to give a one-time gift or if you would like to establish a regular pattern of giving, consider registering for automatic payments from your credit card or checking account by clicking HERE​. You may also give through the Zelle portal. Zelle is a free, secure, convenient way to transfer funds with just a smartphone. The easiest way to get started is to simply open your bank's app from the download store and select QuickPay® with Zelle® from their menu. You will be able to add new recipients by including the person's name, email, and phone number. You will receive a confirmation each time you use the service. Pastor Thomas Rose's email and phone number are trose@ocsfc1.org and 949-278-4555. All of the giving options we provide are not just convenient and easy to use, but are secure, private, and safe. You can give in person, online or via USPS mail with full confidence. From the tithes and offerings that we receive, we pay our expenses just like any other ministry. We are very judicious in how we go about securing services and supplies for this Church. To our Friends and Family of O.C. Singles for Christ Church, we praise the Lord for His Abundant Provisions thru you, and we are grateful and humbled by your generous support to this Church! Thank you for your generous ongoing support of O.C. Singles for Christ Church. P.S. As you know, your gifts and tithes are tax deductible. Our I.R.S. 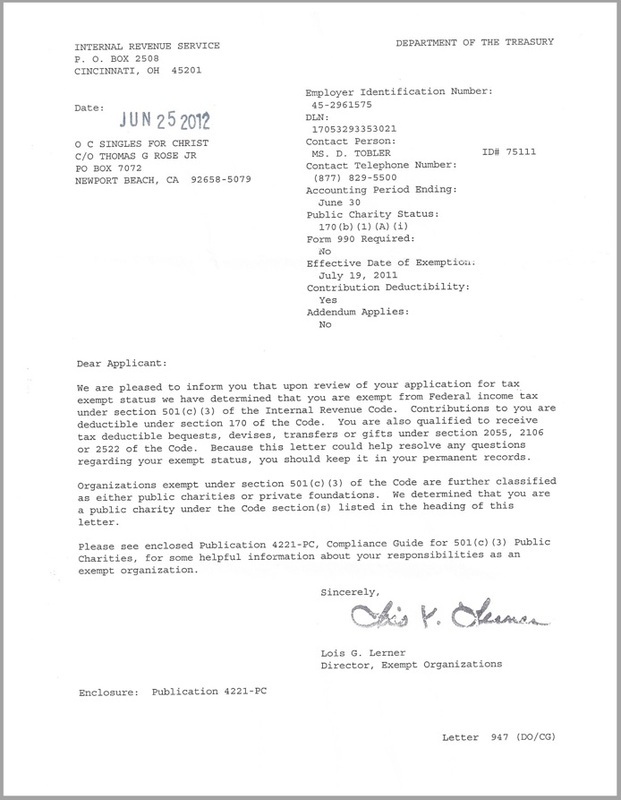 Determination Approval Letter is available below so you can give it to your tax accountant come next year’s tax filing. Please print out this attachment and keep it in your files for your 2018 tax deductions.